One of our recent blog articles, The Pain of Separation: A Parent’s Concern, addressed the anxiety that parents often deal with when separated from their boarding student. This article provides a few tips for both parents and students to help make the initial transition into boarding school smoother. Parents and students alike may help ease their anxiety by coming to school armed with knowledge of what it will be like. Research your school of choice and be empowered through knowledge. If possible, visit the school ahead of time with your child and see where they will be living and the people they will rely on for support. If a visit is not on the cards, read blogs and testimonials from the school. Get to know the school’s social media presence. Understand what the daily schedule is like for classes and activities. All of this will make the first days at the school feel less foreign and knowing what to expect can ease homesickness. Find a school, like Brillantmont International, that is small and offers individual support and outstanding pastoral care for your child. This is essential for helping children get through the inevitable homesickness at boarding school. A small size provides easier access to staff and gives children a family away from home among their fellow students. In addition, encourage your first time boarder to reach out for support to other students who have already made this transition. Your child is not the first to experience some of these things and knowing that there are others close by who have had similar struggles can be a great comfort. Carefully consider the age at which your child will first be attending boarding school. 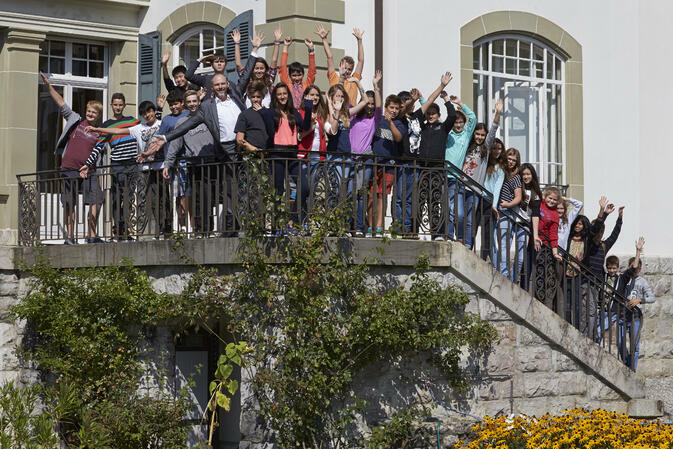 Brillantmont International School starts its boarding programme for middle school students age 11. Brillantmont has found that by this age students can better integrate and feel happy and settled. There are a number of reasons why parents choose to send their children to school earlie; just be sure to consider the additional challenges that this may bring. Encourage your child to fully engage in all of the extra-curricular activities and community building opportunities that the boarding school provides. In a small school, older students are there to help and support younger students and at Brillantmont the connection between the returning and the new students begins prior to arrival through emails. At Brillantmont, Student Leaders and Advisors the community engagement becomes concrete from the first day new students arrive: introducing them to campus life and House system; sharing their experiences with extra-curricular clubs and opportunities; highlighting the best spots in the surrounding city from food and shopping, to banking; providing mentorship and a safe, family atmosphere when concerns arise and demonstrating and fostering the close friendships and bonds that can be forged in a boarding environment. It can be stressful to not only be far from family but also make new friends in a new environment. The best advice for students is to just be yourself and share who you are with others. Bring something from home, whether it be stories or an object, that you can share with your new friends and teachers. Let them know who you are and enrich the greater school community through this sharing. The above are just a few tips for parents and students to consider. If you have any further questions about Brillantmont International School, the transition into the boarding environment, or anything else, please contact us.